Is there something wrong with this picture? Japan, so long the darling of the high-tech universe can't seem to make a car that is able to stop. 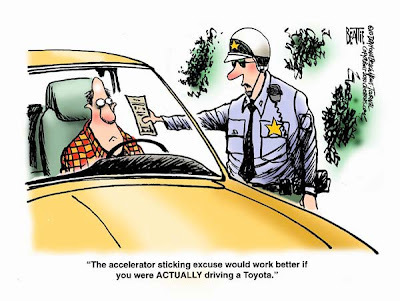 Between faulty Prius brake pedals and other models' - eight I think - gas pedals that keep going, a Toyota is about as popular as watching golf without Tiger Woods. Meanwhile, a middle-eastern backwater headed by a guy called Mahmoud Iamanutjob, announced this week it had begun manufacturing a higher grade of enriched uranium. Why? Oh, gee, I dunno. WMDs? Where's George Bush when you need him? So the question is: if underdeveloped Iran's on the road to nuclear weapons why can't high-tech Japan build a car that'll at least stay on the road? The Vancouver Winter Olympics open today. The only problem is, its not very wintery in Vancouver. Most venues are fine but rain and mild temperatures have wreaked havoc at Cypress Mountain, the venue slated to host freestyle skiing and snowboarding events. Organizers have been trucking in snow from as far away as 160 miles away. Canadians have been more interested in if the trucked snow will get there in time more than the progress of the Olympic flame, captured throughout the day on the CBC News Network in a segment entitled "The Road To The Olympics"! But wait a minute. Doesn't anybody remember that story last year about Chinese meteorologists seeding the clouds over Beijing to make fake snow? A British music hall song told us it was a long way to Tipperary? Well, it's a longer road for snow to carry. Someone once coined the phrase it was a long road to hoe? Well, it's a longer road with snow. The Eagles once sang it was a long road out of eden? You can bet it's a longer road than seedin'. For the sake of freestyle skiers and snowboarders, I hope we're not on the road to ruin. We live in a wacky world. Comments: Ship snow via anything made by Toyota. It will get there much faster. Secondly, I'm now taking odds on when Israeli F-16's and 15's pay Imanutjob a visit. Don: Ha, ha. It'll get there much faster but it may not stop when it gets there! Hey! You're in a "punny" mood today! Quirks: It's so unfortunate that the winter olympics are quickly becoming the summer olympics. I think there's more snow in Arizona right now than Vancouver! If they use Toyotas to haul the snow, it might get there faster. Just sayin. CL: But as I said to Don they may not be able to stop it when it gets there! Hey, do you know that Rush will be performing at the opening ceremony of the winter Olympics? Doesn't have anything to do with your post, per se, but still. Yes, we do live in a wacky world, that is for sure! What would we do if we didn't, Dufus? Certainly would be boring. Maybe after global warming has had it's impact on the Winter Olympics we will have sports like the uphill hill climb or the all-terrain skateboard competition. Just sayin. I'll tell you what worries me: If Toyota can't build a car that won't stop when it's supposed, how can we trust Iran (or anybody else) to build a nuclear reactor that won't blow up when it's not supposed to? P.S. -- I hope I'm in Vancouver when the world explodes. It's pretty there, even without snow. Oliver: Rush? Cool! I look forward to that. Tgoette: It'll be fine as long as the skiers find a lake with a hill. Mike: It's not the reactor that worries me it's the warhead. Mike: Vancouver's a great city. Used to travel there for business a lot. Miss it. It's a longer "row" to hoe, not "road"
Anon: Oh my God the anonymous literary police are out today. On a humour blog we take some liberties from time to time; make a little pun, have a little fun, get down tonight.